0% Brokerage and Best Deals Guarenteed! Balaji Symphony in New Panvel, Mumbai Navi by Space India Builders and Developers is a residential project. The project offers Apartment and Studio Apartment with perfect combination of contemporary architecture and features to provide comfortable living. The size of the Apartment ranges in between 333.68 sq.ft.  and 1310.0 sq.ft. The size of the Studio Apartment is 193.75 sq.ft..
Balaji Symphony price ranges from 51.79 Lacs to 1.24 Cr. Balaji Symphony offers facilities such as Gymnasium and Lift. It also offers services like Banquet hall. This is a RERA registered project with registration number P52000001043. Bank loan approved from HDFC home loans, ICICI, State Bank of India, Central Bank of India, Punjab National Bank, AXIS Bank LTD., Indiabulls, Dewan Housing Finance Corporation Limited (DHFL) and GIC Housing Finance Limited. It is a ready to move and under construct project with possession in Sep, 2018 with few units already sold out. The project is spread over a total area of 10 acres of land. It has 25% of open space. Balaji Symphony has a total of 11 towers. The construction is of 33 floors. An accommodation of 2039 units has been provided. Balaji Symphony brochure is also available for easy reference. Mumbai because of its developments is rising as a real estate investment destination for both buyers/investors and developers. One of the prime reason for the positivity its realty market has been the massive infrastructural developments making it smooth to travel across micro-markets. The developers from Mumbai focus on buyer's need and come out with inventory that suits every income group. The increasing affordability of the population in the city is another reason that has added to the growth of the real estate of the city. 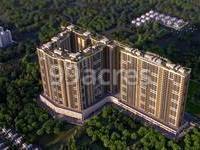 What is the project location?The project is located at New Panvel, Mumbai Navi. What size of flats are available in Balaji Symphony? The apartment sizes in the project vary from 331.0 sqft to 936.0 sqft. 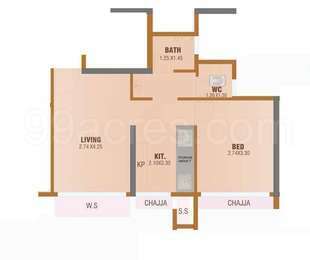 What is the area of 2 bhk in Balaji Symphony? The size of a 2BHK unit in the project ranges from 430.0 sqft to 849.0 sqft. How much is the actual area of Balaji Symphony?The area of the project is 10.0 Acres. al, Karjat, Khopoli, and Ulwe. From the last nine years, Space India has made its heart-warming presence felt in the Indian International markets. Space India has a success story of 20 completed projects with 10000 flats and 15 currently under construction projects. Apart from constructing marketing residential properties we also provide assistance in land acquisition to developers investors. Space India also runs a housing loan department to assist customers in understanding their eligibility/processes later assist them in availing loan from prominent banks. Space India?s Management has an experience of 600 person months in Design, Execution, Operation, Finance, Marketing Sales which enable it to be a successful real estate venture. The management is ably assisted by a core team of sales, customer support, IT and marketing professionals. Over the years the management has developed a tried tested formula for successfully executing marketing a project. Space India is synonyms with real estate in Navi Mumbai peripheral market and is treated as one stop destination for flats buyers home loan seekers. What is Commencement Certificate (CC) status of Balaji Symphony? Hello Rohit, Space Builder has got Commencement Certificate (CC) for this project. Please give me some details about Vascon Ela The earth. what are the specifications and nearby proximities of this project? Vishesh, I would suggest you to visit the site once and confirm all the details on your own if you are keenly interested in this project. There is no other better way to judge the project. Vishesh, as per the amenities and the location of the project, it seems good for end use and the builder is also a reputed one. They have developed several projects across Bangalore. So, I don't think there would be any problem in investing here.